Search less and build more. ARC’s hyperlinking solution puts the documents you need right at your fingertips, wherever and whenever you need them. Organizing, indexing, hyperlinking, and maintaining all of the documents associated with a complex construction project is time-consuming, which leads many firms to stick with outdated and inefficient paper-based document management systems. It doesn’t matter how good you are; if your project information lives solely on paper, you’re losing time and money. ARC’s cloud-based hyperlinking solution saves you both and ensures that all of your files are properly tagged, linked, and organized for fast retrieval from any device with a single click. In many cases, hyperlinking is an automated process that does not deliver the results you truly need. Files auto link to the incorrect documents, the wrong section of a document or don’t link at all. Some service providers’ solutions can only hyperlink PDF’s. We are different. ARC not only provides industry-leading hyperlinking technology, but we also have experts on staff that dig deep into the documents, relating all your files and connecting layers of call-outs down to the nitty gritty details you require. Improve quality control and ensure information is put in its proper place. Hyperlinked construction documents can turn a paper mess into an organized index that is accessible at the click of a button. Instead of flipping through hundreds of plan sheets or a 6” thick binder, you can now get directly to the information you need in seconds instead of minutes or hours. Most construction projects come with thousands of pages of documents, which means getting your hands on the exact information you need often includes searching through large volumes of hard copies until you find what you’re looking for. Countless hours are lost to rework when your team and your contractors aren’t working from the current set. With construction documents that are digitized, indexed, and hyperlinked, navigating thousands of pages becomes the work of a few seconds, instead of hours, empowering everyone on your team to be more efficient. A Complete Construction Document Management Process: Hyperlinking begins with a comprehensive file and document audit to capture and digitize all of your project documents. This process, when completed in-house, requires full-time attention from one or more of your team members and an investment in the right equipment to handle all of your documents. When you enlist ARC as your Hyperlinking partner, you get the benefit of smarter, easier to navigate documents while your team stays focused on doing what they do best. Auto-Hyperlinking: As your documents are digitized, they are scanned for sheet names and callouts while leading-edge OCR (Optical Characteristic Recognition) identifies information that refers to other pages in the set. Clickable links between pages are created while missing pages and potential errors are flagged so they can be reviewed and resolved before problems occur. Custom Dashboards: ARC works with you to create the standards that fit into the way you do business. With custom indexing and dashboards, your hyperlinked documents follow your company’s guidelines and processes rather than creating new procedures for you and your team to adapt to and learn. Custom mobile project dashboards offer a user-friendly and powerful tool for you and your team to access the documents they need quickly and easily from a single streamlined document hub. Cloud Solutions for Document Control: Your hyperlinked sets aren’t just more straightforward to navigate than paper, they’re more collaborative and portable than paper, too. Your team and contractors can retrieve the information they need in seconds without the delays that come with trekking back to the trailer to consult with a drawing or verify specs. Deliverable: When the job is done, you have a downloadable project closeout deliverable with the entire lifecycle of the build and up-to-date As-builts to hand over to stakeholders and facility management. Research shows that for every $1 million in value, the average project will have 15-20 RFI’s per day. The administrative and technical tasks required to review, research, and respond to just one RFI takes a combined eight hours of labor and bears an alarming $1080 price tag. ARC’s customers shave weeks off of their construction projects and reduce overtime and rework by hyperlinking project plans, as-builts, RFIs, ASIs, specs, and more. When your projects happen on paper, finding the document you need is only part of the battle. Communicating changes to your contractors in anything less than real-time can lead to delays and rework that add additional time and take up more of your budget than projected. 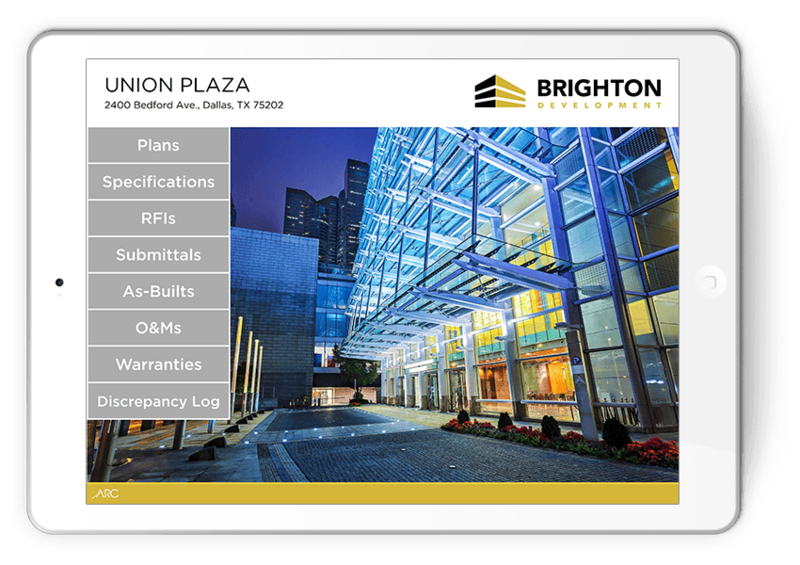 With digitized hyperlinked document control, everyone involved in your project—from inspectors to owners to engineers to subcontractors—can feel confident knowing that they are using the current set with the most up to date information. Find what you need in seconds instead of hours with powerful, smart searching and drill down capabilities. Lightning-fast search lets you navigate thousands of pages in seconds and drill down to related documents and drawings, so you never miss out on critical changes or details. The ARC team goes beyond the standard auto-hyperlinking process and digs into all of your documents to ensure that all of your layers and callouts are connected and appropriately indexed, so your searches return fast and accurate results. Everyone on your team can find the documents they need where and when they need it, with easy-to-use custom dashboards. What’s the point of digitizing and hyperlinking your files if accessing them is so cumbersome and complicated that nobody on your team can figure it out? 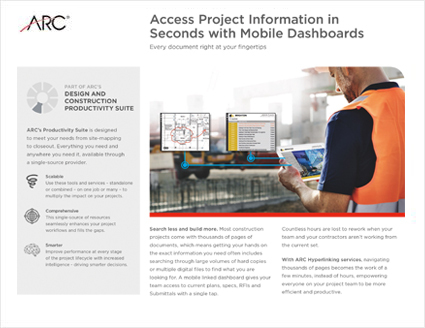 ARC’s mobile dashboards offer intuitive, easy navigation that works with its users instead of against them. Search, select, expand, find callouts, drill down, and navigate through drawings and pages with ease, and without lengthy training sessions or single-purpose equipment. Auto-hyperlinking is supported by ARC’s expert services team who will continually monitor your project to ensure it’s meticulously indexed and accurately linked. Paper documents don’t allow for a central and navigable table of contents. Sadly, neither do many hyperlinking service providers. ARC works with you to set standards for your company to ensure consistency across your jobs. A custom index lets you tag, organize, and link all of your project documents, so they’re accessible not just through your customized digital document paths, but from a central table of contents, as well. ARC’s construction document management system helps you gain the highest returns on your drawings, your skills, and your time. Every hour spent searching for drawings, responding to RFIs, or trudging to the trailer to check specs is an hour that you could be spending focused on what matters most to you and your business. ARC’s decades of experience in the AEC industry means we’ve developed our solutions to meet the unique needs of businesses like yours. When our customers share their challenges with us, we put our teams to work to create and perfect an industry-specialized solution that gives AEC firms the tools they need to gain the most from their teams. When it comes to construction document management, that solution is ARC Hyperlinking.